Trailers have the fastest turnarounds available in the global power sector. For time-critical projects, they have many advantages over conventional substations, other mobile options and fast-track strategies where components are installed on-site. Each production phase is streamlined so that products go from design to commissioning rapidly. Most substation trailers are assembled, tested and shipped from our facility in a matter of weeks. By completing critical processes off-site, we avoid the time and expense of sending crews to the field. It is also easier to deliver substation trailers. Compact skid-mounted substations can be transported by train, plane or truck for faster delivery. When the skid arrives, we can complete the setup and energize the equipment immediately so that there are no delays. Portable plug-and-play substations save time during installation and increase the reliability of electrical stations in all locations. Portable skid-mounted substations are an integral part of fast-track power projects in many sectors. These mobile units can be customized for alternative energy transmission, three-phase industrial sites and other applications in existing and emerging markets. Self-contained units and multi-bay configurations are ideal for use with overhead transmission lines or underground XLPE cable. We engineer trailers that can accommodate an air-insulated substation (AIS) for lower voltages or a gas-insulated substation (GIS) for high-voltage transmissions ranging from 72 kV to 420 kV. Hybrid options are also available. Our portable skid-mounted substations and trailer-mounted control buildings have these advantages. 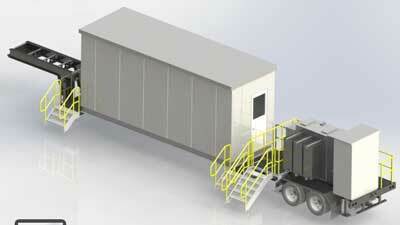 Modular units enable fast-track sites to be energized earlier. They are ideal for short-term and semi-permanent facilities. Portable equipment is easily moved to different sites as needed. Additional modules can be added as demand increases. Units allow for continued operation during expansions and updates. Self-contained modules withstand extreme temperatures and weather. Trailers are four times smaller than conventional substations. The cost of on-site labor and installation is reduced. Multiple modules can be combined to increase voltage capacities. Low-voltage trailers are ideal for the transmission of alternative energy. When used as a strategically placed backup, trailers increase reliability. Portable substations that are prefabricated to your specifications can overcome logistical and budgetary obstacles prohibiting the construction of conventional high-voltage substations in undeveloped areas. Our high-voltage solutions offer multiple benefits for clients operating in remote sites and high-risk, high-reward markets.